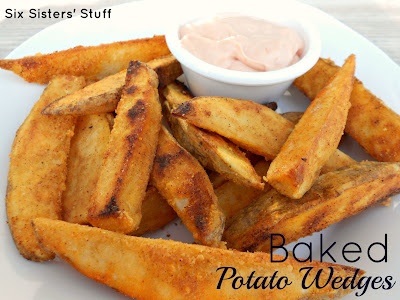 These Baked Tater Wedges are so easy to make and are the perfect side dish to any meal. They come together in minutes, and taste absolutely amazing in our Fry Sauce Dip recipe. If you are looking for the perfect side dish, look no further. These are a staple at my house (and you probably have all the ingredients on hand to make them right now). They are so easy to throw together, super inexpensive, and my kids LOVE them. I love that they are baked and not fried- but they still have a “crunch” to them. They also have great flavor. Definitely a keeper. I am a huge french fry and potato wedge fan, however, I tend to get a little stomach ache after eating them, since they are fried. I love these potato wedges, because no frying is necessary. These are baked, and taste absolutely amazing. Have you ever heard of Utah’s Famous PINK Fry Sauce? OH. MY. GOODNESS. Once you have tried it, you will never go back. Fries and hamburgers will never taste the same once you have had this. And it compliments these Tater Wedges perfectly (I have heard that many people outside of Utah eat this too . . I am so happy to hear that it’s not just a Utah thing. It’s too good not to share with the world). Mix together until thoroughly blended. The great thing about this is you can add more ketchup/mayo to how you like it. I know that some restaurants substitute BBQ sauce for the ketchup, which is really good too. I have also thrown in some relish, which adds a yummy taste. Some people also prefer hot fry sauce and kick it up a notch with Tabasco sauce. I have even heard of people adding a couple drops of liquid smoke or Worcestershire sauce. Basically anything goes with this sauce. The original with just ketchup and mayo is delicious, but you may like a little extra flavor. I will say, my favorite combination is a little added bbq sauce, and a small scoop of sweet pickle relish. I can’t get enough of it. Add your oil to a baking sheet with sides. Combine all dry ingredients into bag?either Ziploc or paper, and add a few potatoes at a time. Shake to coat well. Place the potatoes coated side down into the oil in the pan. Continue doing this until all the potatoes have been coated and placed in the oil. Bake for about 20 minutes and then pull out and flip over on the other side. Bake for an extra 20 minutes. Pull wedges out of the oven and then sprinkle with a little kosher salt. Serve hot. I love this recipe - my family would love it as well!!! Thank you for sharing another fabulous dish! Thanks for sharing the recipe! As for the pink fry sauce my family has been making it for years, except we call it secret sauce and make it with Miracle Whip instead of Mayo. It's good with fries and on burgers! I think to make the best fry sauce it needs a little pickle relish or something. Seriously? Utah's Famous Fry Sauce? I am 51 years old and have been mixing mayo and ketchup together since I was in diapers and guess what, I'm not from Utah! My thought exactly. I've been doing this for years and I've never been anywhere near Utah-I grew up in Texas! This is not solely a Utah thing. It's utterly delicious though and I have to say my husband thinks I am wierd for doing it. These potato wedges are wonderful! I have made them twice now and just came back to get the recipe again so I could make them to go with dinner tonight. Thanks for a great recipe! Eeew! My roommate in college used to mix mayo and ketchup all the time. It would make me gag because mayo stinks so bad. Ha Ha Ha! Maybe try Crown Burger's Fry Sauce.. then you might change your mind! It is to DIE FOR! Yummy I want to make these right now lol. Great blog check out my food blog. 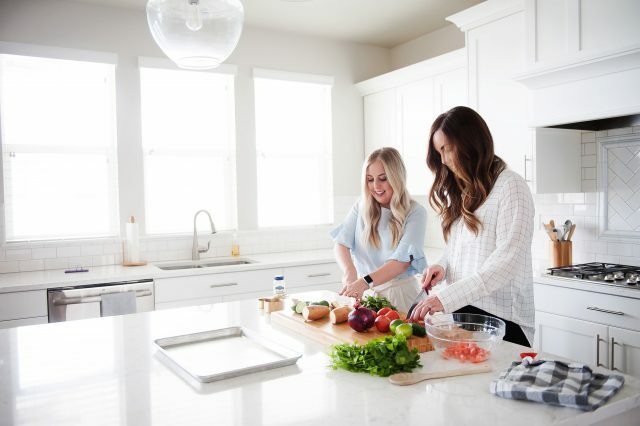 I've completely changed the way my family eats this year, and I'm allways looking for new recipes that are both healthy and tasty. Thanks for a great recipe to eliminate the frying in fatty oil! A quick tip on how to make these just a little healthier: after you slice the potatoes, soak them for 20 minutes in cold water, then rinse before coating. This will release some of the starch (you'll actually see it floating in the water)so there won't be as much for your body to convert to sugar! Yummy! I've also added a little horseradish into the fry sauce for a little kick. This is a very popular sauce in the South and we add pepper to the mayo/ketchup mix. Some folks call it Comeback Sauce. Delish!!! Can't wait to try this recipe. Thank you so much for posting it!!! I love going back and forth between ketchup and mayo. I never thought to combine them. Can't wait to try fry sauce. I make my fry sauce with some pickle juice added to it! I live in New Mexico but I was in SLC at a little greek place when I tried it for the first time. Love it! When my neice was in elementary school, the only thing that she would take for lunch were ketchup and mayonaise sandwiches. Can you deep fry these?? Sure! That might add to the calories and fat, but they would be delicious! I like to mix mayo with a little garlic, black pepper, paprika, oregano and a very little bit of ketchup... If you're not a fan of mayonnaise you probably won't like it, but I LOVE it with fries, fried chicken, etc... It is really good! I miss Arctic Circle! Special Sauce/fry sauce...and the best shakes in the world! They do have amazing shakes! Have you ever frozen these? I'm stocking my freezer before new baby comes and would love to make and freeze a batch. Any suggestions? That is what we do with our fry sauce, add a little pickle juice. And also a little less ketchup for my taste. Oh how I love fry sauce!! Made the fries & sauce last night to go with the Cheeseburger wraps. Easy & good! The family has asked that this go into the monthly mix of recipes. Thanks for sharing! I always thought this was a Burger King thing when I first started working there all the kids did this thought it was gross until I tried it. We never measured a glob of mayo and add some ketchup to your taste. I even got my kids and grandkids eating it. In Western PA we add horseradish or garlic..depends on the restaurant or family preference. When I lived in Utah many years sgo there was a hamberger joint that msde thrir fry sauce with mayo, Ketchup, and a little buttermilk. It was better than Artic Circle. And I loved artic circle! Try eating your fries after dipping in mayo. Have been eating this way for over 50 years. Turns out many in The Netherlands eat them this way as well. My Dutch hubby has always eaten this way too. Imagine the surprise when we figured out we both eat our fries like this and have always done this. It has to be Hellman's Mayonnaise-NO MIRACLE WHIP. This is actually similar tasting to Potato Salad. Utah Fry Sauce? OooOOo Nooooo...we've been making this in Oregon for many years! I'm 62, and my Mom made it for years b4 children...This is an Artic Circle Hamburger chain's "claim-to-fame"....Even the local Dairy Queen makes it now! Here is an FYI from Google search: Famous for their fry sauce. Arctic Circle Restaurants is a chain of burger and shake restaurants based in Midvale, Utah, United States. The Original Arctic circle was located in Midvale Utah. This was the Original marketing of the product we all know now as Fry Sauce. It is a Utah product but can be found all over the world. The original mixes began 75 years or more ago. But it was Arctic circle who first produced and marked the product as a routine supplied product. That was again in Midvale Utah. How ever many fast food chains in Utah carry Fry Sauce were they don't in any other location in the country. This even included Utah local McDonald's as well until recently when they decided to keep there supplies uniform to all other locations including utah locations.